Caching is an innate behaviour that many animals exhibit and involves hiding food for later retrieval; not dissimilar to humans stocking a cupboard with food. 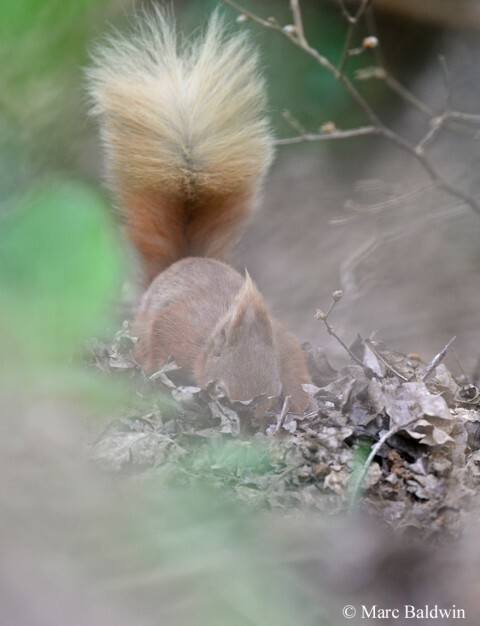 Where and how carefully a squirrel chooses to bury a nut is influenced by a variety of factors, including the landscapes, type of food (some are more perishable than others) and the whereabouts of other squirrels. Indeed, with respect to the latter, a squirrel will make false caches if it thinks it's being watched. Squirrels seem to have a good spatial memory, which helps them relocate their caches, although it has been suggested that memory guides the squirrel to the area and scent guides the squirrel to the specific location of the cache over the final few centimetres. Caching is the process of storing (or, if you’ll excuse the pun, ‘squirreling away’) food is surplus to immediate requirements for later retrieval. We humans do this too, making a weekly or monthly visit to the supermarket and stocking up the cupboards and freezer. The aim is to provide the “cacher” with a larder from which food can be acquired when conditions are tougher. In evolutionary terms, for caching to persist as a behaviour the benefits must outweigh the costs. In other words, having a store of food when times are hard, such as during the depths of a freezing winter, must outweigh the costs imposed by spending time looking for a suitable place to bury it – time that could be spent eating, looking for a mate, or watching out for predators. Moreover, for caching to be adaptive, the cacher must stand a good chance of recovering the food from their own cache, before someone else finds it. Otherwise, it’s a waste of the cacher’s time and effort. Caching can also provide some short-term direct benefits, because if the cacher can raid their larder during busy times, such as when raising young or looking for a mate, and therefore need to spend less time searching for food. We still don’t really know why some foods are eaten straight away by a squirrel while others are cached, although many theories have been proposed. One very interesting idea is that squirrels decide whether to bury a nut or seed based on its tannin content. Tannins are chemicals called polyphenols and are found in many different plants; high concentrations give wines and ciders their ‘dry’ taste. There are different types of tannin but essentially most change the shape of enzymes in the mammalian gut, which stops them working properly and can lead to malnutrition. They can also inhibit water absorption in the gut, causing dehydration, as well as causing ulceration of the gut and kidney problems. The theory goes that burying foods such as acorns may allow some of the tannins to leach out, making them less toxic. Indeed, studies have shown that leaves buried by pikas (Ochotona princeps), a small relative of the rabbit that lives in the mountains of western North America, lost a significant amount of their tannins. Meadow voles (Microtus pennsylvanicus) have also been observed to cut conifer branches, which are high in tannins, and lay them in the snow for several days before eating them; during this time, the level of tannins in the branch dropped to a level found in the voles’ preferred foods. A study by Ohio State University biologists Peter Smallwood and David Peters, published in the journal Ecology in 1986, reported that when presented with food items identical in every respect except for their tannin content, Grey squirrels ate less of those with high tannin content than those with low tannin content. Perhaps more interestingly, the study found no evidence that tannins had any significant adverse effect on the squirrels’ ability to digest protein; i.e. the Greys could detoxify the tannins. Smallwood and Peters suggest that squirrels use the tannins as cues to determine the perishability of the acorn, basing their decision on whether to cache or not on this factor. A more recent paper to the journal Ecological Research by Takuya Shimada at the Kansai Research Center in Japan, however, found no significant changes to the tannin astringency of sawthorn oak (Quercus serrata) acorns or horse chestnuts (Aesculus turbinata), even after three months of burial. Shimada suggested the physical properties of acorns, including their smaller surface-area-to-volume ratio than things such as branches and leaves, may reduce or prevent the tannins leaching out. How ever squirrels judge the a seed’s ‘best before date’, the “Perishability Hypothesis” fits nicely a study published in the journal Animal Behaviour during 1996, which suggested that a seed’s perishability may be more important to a squirrel than the time it takes to break into and eat it (the handling time). In their fascinating paper, Leila Hadj-Chikh, Michael Steele and Peter Smallwood looked at how Greys cached two different types of acorns: white oak and red oak. These two acorns have considerably different germination schedules. Red acorns are dormant during winter and germinate in the spring, giving them a low perishability. White acorns, by contrast, germinate shortly after they mature in the autumn and therefore have a high perishability. The biologists found that, regardless of the handling time (a reflection of the acorn’s size), squirrels consistently cached red acorns, while consuming the white ones straight away. Moreover, when the squirrels were seen to cache white acorns, they excised the embryo before burying it; in acorns, the embryo controls maturation and removing or killing it means the acorns won’t germinate and can be stored for longer. Similar studies elsewhere have shown that squirrels will eat acorns infested with insect larvae but caching those that are not, although it has been suggested that the squirrel is actually after the extra protein the larvae provide and do not understand that insect infection reduces the durability of the acorn. Nonetheless, the current evidence supports the idea that, Grey squirrels at least, take the perishability of a food item into account when deciding whether to bury it or eat it now. Jacobs tested this theory on five hand-reared adult male Grey squirrels and found that, when deciding whether to cache or eat an item, they seemed to do whichever took the least amount of time. 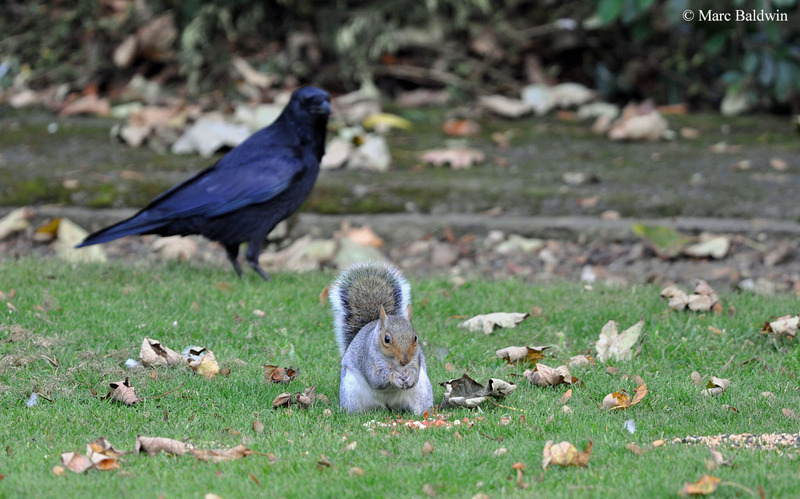 In direct contrast to the results of Hadj-Chikh and co-workers (above), Jacobs found that the relative perishability of the food item was less important to the squirrels than the handling time – the squirrels consistently cached the chow blocks she offered rather than the shell-less hazel nuts, despite the fact that the chow blocks were highly perishable, disintegrating quickly when buried in the damp ground. Jacobs concluded that squirrels cached the show blocks because they took longer to eat than the hazel nuts, even though they had previous experience trying to retrieve buried blocks. Given that, so far as we know, mothers don’t teach their kittens what to eat or how to store it, having this inherent urge to store your food invariably offers a survival advantage. Caching is a very important aspect of squirrel life and care is taken in the placement of the cache and in the covering of it so it’s not obvious to passers-by or spies. Caches fall broadly into two categories: you can put all your eggs in one basket, so to speak, which we call larder caching; or you can scatter your valuables all over the place, which is scatter caching. Larder caching is less effort because everything is in one place and you can easily see how much you have left. The problem, however, is that if your cache is discovered by someone else they can take everything and leave you with nothing. Scatter caching makes it less likely you’d lose everything, but requires more effort to find suitable spots, dig all those holes and, more importantly, remember where you’ve put everything. Have you ever been doing the spring cleaning and found a Christmas present you’d hidden for one of the kids? Red and Grey squirrels scatter cache and, given that a Grey squirrel may cache some 3,000 nuts during a season, remembering where they all are when they’re spread throughout the woodland is no mean feat. Some early work suggested that squirrels may not be too bothered about where they cached because their neighbours were family members and they therefore shared each other’s caches. This is the so-called “Communal Cache Theory”. 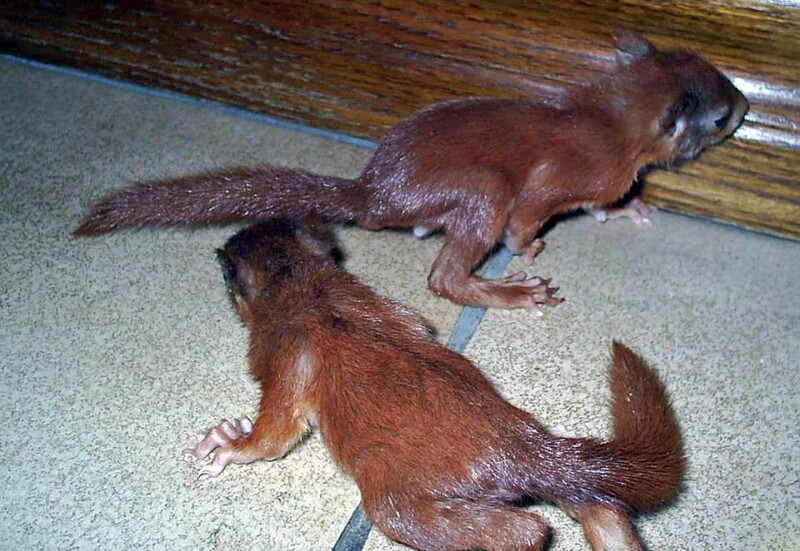 More recently, however, Mark Spritzer and Baniel Brazeau investigated this and found that neighbours weren’t necessarily relatives and that squirrels moved nuts toward the centre of their territories, grouped their caches, buried nuts further from their source when competitors were around and aggressively defended caches from would-be pilferers. In other words, it was every squirrel for itself. Spritzer and Brazeau’s observation that squirrels took their nuts further away when competitors were nearby is particularly interesting because it implies another angle to caching decisions, beyond simply how perishable the item is or its handling time. Moreover, Spritzer and Brazeau weren’t the only ones to observe this and a study by a team of Japanese biologists, led by Noriko Tamura, found the further away Japanese squirrels (Sciurus lis) took walnuts, the less likely they were to have their cache pilfered by other squirrels or woodmice (Apodemus speciosus). We now know that squirrels will take cache protection a step further than just moving further away when they think they’re being watched – some make 'fake' caches to try and throw potential pilferers off the scent. They also seem to recognise other squirrels as a particular threat. In a series of experiments at the University of Exeter campus in Devon, Lisa Leaver and her colleagues found that their Greys took evasive action, increasing the distance between caches and caching with their back to the observer, more often when another squirrel was watching than when a magpie or crow was watching. 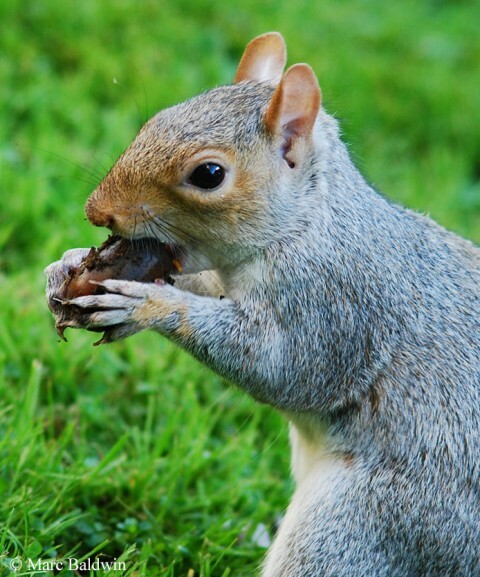 While studying Greys on the Exeter Uni campus between October and December 2006, Lucy Hopewell and Lisa Leaver found that squirrels spent longer disguising their caches and were more likely to stop digging and become vigilant when other squirrels were hanging around than when they were alone. Squirrels spent longer disguising their preferred food (hazel nuts) and stopped digging to become vigilant more often when storing hazelnuts than almonds. These findings indicate that caching squirrels remain aware of other squirrels in the vicinity until they’ve finished caching the item and behave differently when caching preferred over less preferred items. More interesting than the idea that squirrels recognise other squirrels as potential thieves is that this view appears to change according to how much food is available. Researchers at the University of Exeter conducted a fascinating series of experiments on their campus between May 2006 and July 2007, during which they found that when the Greys were alone they took their food off and cached it at distance from the feeding site. When other squirrels were present, however, each took their food shorter distances to cache, allowing them to return more quickly and thus visit the feeding site more often. The biologists concluded that, at this point, the squirrels saw each other as competitors rather than potential pilferers, so they were more worried about the other animals taking the food that was there, than anyone noticing where they were caching their food. As the amount of food on the feeding site started running out, however, items were cached at increasing distance from the site, suggesting that the squirrels now saw the others as potential pilferers. It may seem something of a deductive leap to suggest that squirrels know what each other are thinking, but cache pilfering is a well-documented phenomenon among squirrels and pilfering rates in the literature range from 1% to 95%. In order to see whether squirrels were able to gain information about what others were doing around them and use that information for their own benefit (a phenomenon known as social learning), the biologists at Exeter offered their campus squirrels a choice between two identical-looking pots. The subject was made to watch another squirrel empty one pot, before being given the choice of which to open; they were rewarded with food if they chose the opposite pot. In a second set of experiments, squirrels were asked to choose a pot, the full ones of which were marked with a piece of card. The researchers found that the squirrels performed better (i.e. chose the correct pot) more often when there was another squirrel involved and concluded that squirrels were more efficient at using cues based on conspecifics than inanimate cue cards. In the wild, it seems likely that the ability to assess feeding opportunities based what other squirrels in the vicinity are doing would be a significant advantage. Provided that the entire area is suitable for caching, the “Optimal Density Theory” predicts that a squirrel should use the entire 360-deg arc around the resource, which should ensure that caches are placed at a density that prohibits the majority of naive competitors from finding them. Think how much more difficult your grocery shopping would be if, rather than putting all the fruit and veg together, the supermarket spread it evenly around the store. This works well on paper, but the studies to-date suggest that squirrels don’t conform to this theory and instead cache in only part of the available area. Clustering caches like this probably improves the likelihood that the owner will be able to find them later. 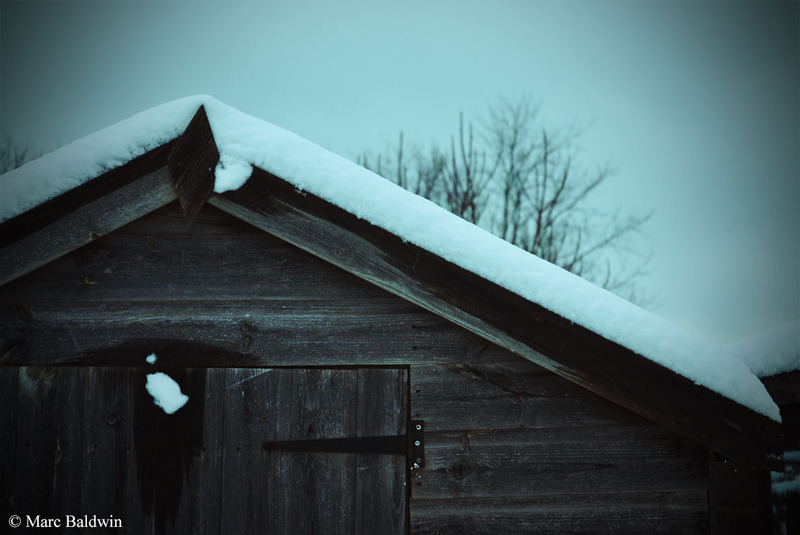 (Arguably, the more difficult you make it for others to find your caches, the tougher you’re likely to find it to recover them several weeks down the line.) If you put all your caches in a small area around, say, your nest, all you need to do is remember the general location. Granted, having all your caches in a relatively small area means that a thief who finds one may find others, but scatter caching (rather than larder caching) my help to offset that cost. Rice-Oxley watched 266 burials and noted that 27 (10%) were moved within the two-hour observation period. Five of the re-caches were made by the owner, while 16 were stolen by other animals and re-buried elsewhere, usually further away from the feeder. The suggestion is that the squirrels may bury them near the feeder to save time, allowing them to come back more often and get more before all the food is gone, and set about redistributing them later. Burying food is one thing, but the real challenge comes in being able to find it again. We’ve known for a while now that cache recovery rates are highly variable, with between 26% and 95% of nuts recovered depending on mast crop. The idea that squirrels remembered where they bury their nuts has been bandied about in the literature since 1884; but only relatively recently have biologists established that squirrels do indeed have excellent spatial memory, which plays a key role. In a paper to Animal Behaviour in 1991, Lucia Jacobs and Emily Liman reported that Greys retrieved more of their own caches despite burying them in an area where other squirrels had also been caching, even 12 days later. 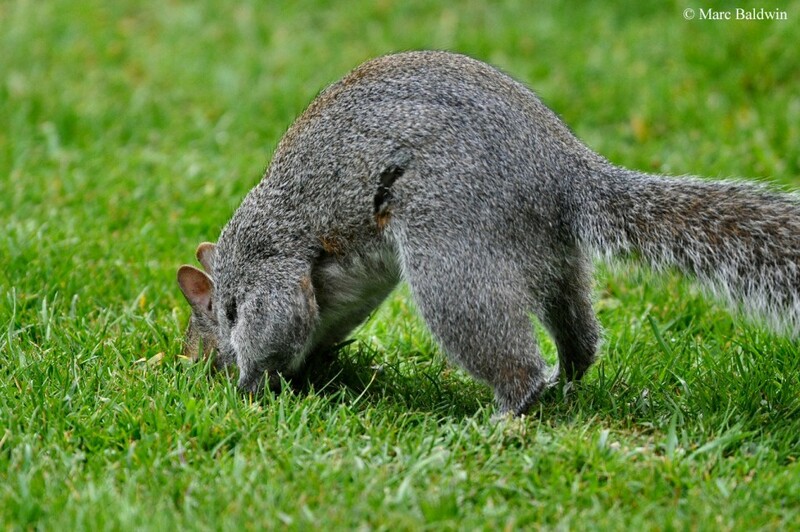 Retrieving more of their own caches, even when the caches of other squirrels were nearby, led the biologists to conclude that the squirrels were remembering exactly where they buried their prize, rather than simply sniffing it out. Nonetheless, the biologists did note that squirrels always excavated at least one nut from someone else’s cache, implying that smell is used in some capacity. Indeed, a study by a team of New York-based biologists, led by Denise McQuade, in 1986 found that Greys had a specific cue hierarchy when looking for caches. The scientists used a series of coloured food dishes to study cache retrieval and found that the first cue was the location of the dish, then its colour and finally its odour. In other words, they remembered roughly where the cache was and what it looked like and used their noses to guide them in the final stage. Furthermore, they even found some evidence to suggest that the squirrels may also remember the type of seed in the cache. Squirrels certainly appear to have a good sense of smell and, in 1978, German zoologist Herbert Wiltafsky reported that Red squirrels could sniff out hazel nuts from up to 30cm away. Jacobs and Linman go on to report how the squirrels moved from one cluster of two or three caches directly to another with little retracing of their path. 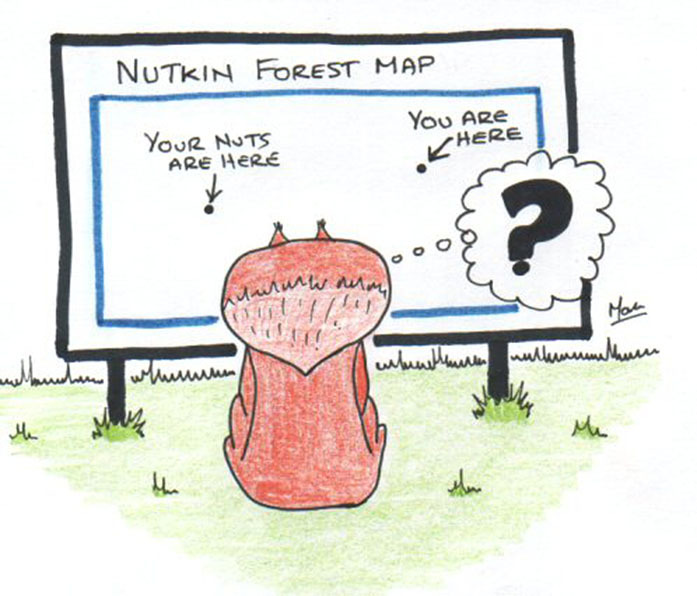 This suggests squirrels can remember a series of locations in relation to each other and use this to build what we call a cognitive map of their cache locations. Establishing that squirrels use a combination of memory and smell to find caches has led some scientists to question what happens in the squirrel brain to allow such remarkable recall. Studies on some other food-caching animals have shown that they experience a growth in parts of their brain during the autumn to help them remember the locations of their buried food. Studies in squirrels have painted a mixed picture. A study published in the journal Genes, Brain and Behavior by neurologists at the University of Toronto in Canada found three-times the density of proliferating cells in the dentate gyrus of the Grey squirrels than in the yellow-pine chipmunk (Tamias amoenus), a small rodent that employs larder caching. The dentate gyrus is an area of the hippocampus, the part of the brain that controls memory and navigation, and represents one of the few areas of the brain in which neurogenesis (i.e. the creation of neurons) is known to occur. The paper also described the presence of more cells containing the Ki-67 protein, which is associated with the breakdown and reformation of nuclei during neurogenesis, in squirrels than chipmunks. Finally, they found that adult squirrels didn’t undergo the same age-related decline in neurons that chipmunks did. Overall, the suggestion is that maintaining this pool of young neurons as they grow older may be necessary for their spatial (cache retrieval) memory. Moreover, young squirrels having increased neuron proliferation and young neuron densities compared with adults may reflect that juveniles have a greater need for learning than adults, having to become familiar with their environment and remember where their food it buried. This study did not, however, find an increase in squirrel brain size associated with caching. Similarly, when Pierre Lavenex at the University of California and colleagues investigated Grey squirrel hippocampus size, they found no seasonal change in size associated with food caching either, although, in their 2000 paper to the European Journal of Neuroscience, they concede that there might be a greater turnover ('births' and 'deaths') of neurons during the caching and retrieval seasons. A related study by the same authors published in The Journal of Comparative Neurology during the same year, reported that males have a slightly larger hippocampus than females, but this difference does not change with season. Curiously, in an interview with the BBC’s Tomorrow’s World during 2008, a “Lucy Jacobs” (Lucidia?) 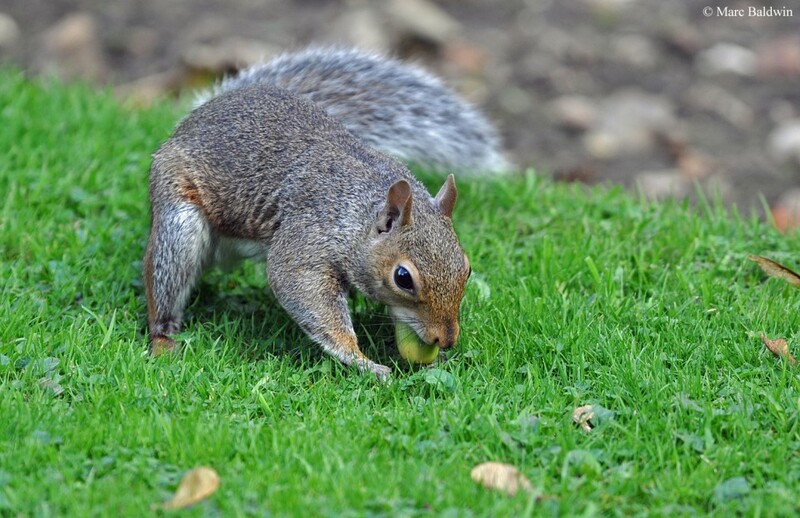 at the University of California discussed caching behaviour in Grey squirrels and noted that her data showed a 15% increase in the hippocampus size during the autumn and spring, when squirrels are actively caching and retrieving their nuts, compared to the rest of the year. Unfortunately, to the best of my knowledge these data have not been published and should, thus, be treated with caution. So, overall, squirrels bury surplus food for a ‘rainy day’ and use their excellent spatial memory, coupled with keen sense of smell, to recover their buried treasure. Sometimes caches are retrieved and re-buried elsewhere; sometimes they’re pilfered by other squirrels, mice or birds. Whatever happens, it is important to remember that not all caches will be excavated and, consequently, squirrels play an important role in the dispersal of tree seeds and in the regeneration of forests. In North America, for example, the Grey squirrel is probably the most important disperser of red and white oaks. Here in the UK, both Reds and Greys contribute to tree dispersal and Reds, in particular, to fungi dispersal. 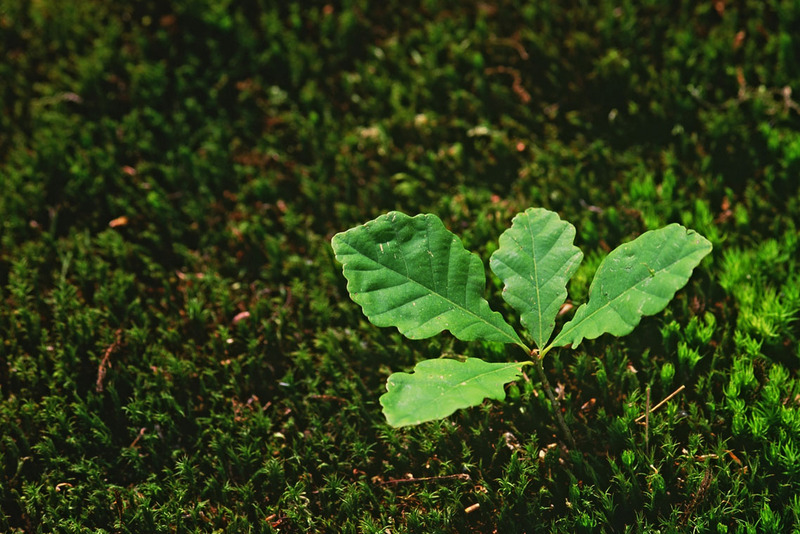 It is ironic to think that an introduced species that is generally considered detrimental to our woodland ecosystem may nonetheless play an important role in regenerating our native woodland.